Executive Summary - One of the rare frequent flyer cards that do not have annual fee and yet still allows you to earn double miles and unlimited miles. A rare gem indeed. Suitable for folks who fly transatlantic with Aer Lingus (most likely to Ireland). 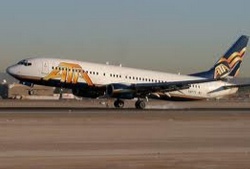 Highly recommended if you fly this airline. Summary - The Aer Lingus Shamrock Mastercard will appeal to frequent flyers of Aer Lingus, especially Irish immigrants who fly frequently to Dublin. This is one of the rare frequent flyer credit cards which has no annual fees, which is a refreshing change from the usual fees that come in this territory. Reward Formula - Cardholders will earn double miles for every dollar spent on Aer Lingus tickets. You will earn a standard one mile for every dollar you spend on other regular purchases. You will get 5,000 bonus miles after your first purchase. You can also earn unlimited miles with this credit card. Aer Lingus miles have a 3 year expiration. Point Requirements For Flights - 15,000 miles will get you an inter-European flight. 25,000 miles gets you $200 off for an Aer Lingus vacation package. 45,000 miles gets you a transatlantic flight (which is actually pretty good). 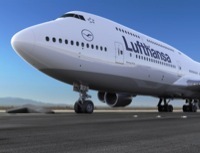 65,000 miles gets you a business class upgrade when you book a transatlantic flight. Fees and Rates - There Aer Lingus Shamrock Mastercard is one of the rare airline credit card that has no annual fee. Verdict - In most of my reviews, I'll normally do some peer comparisons with other cards just to see how it really stacks up. In this case, there is really no need for that. Why? Because this is one of the truly rare airline credit cards that has no annual fee and yet allows you to earn double miles. In the past, airline cards allowed you to waive the annual fee, but it came at the price of only allowing you to earn one miles for every two dollars that you spend in the card. So this card is really an exception. The only gripe one can have about this card is that there is no mega sign up bonuses. But when you only need 45,000 miles to fly to Ireland, can you really complain? At the end of the day, this card will appeal most likely to Irish immigrants to fly home once every couple of years because it is the only card that let's you earn Aer Lingus miles. 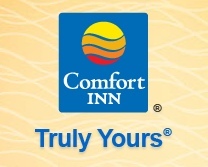 They do not have partnerships with other cards like Membership Rewards or Starwood. 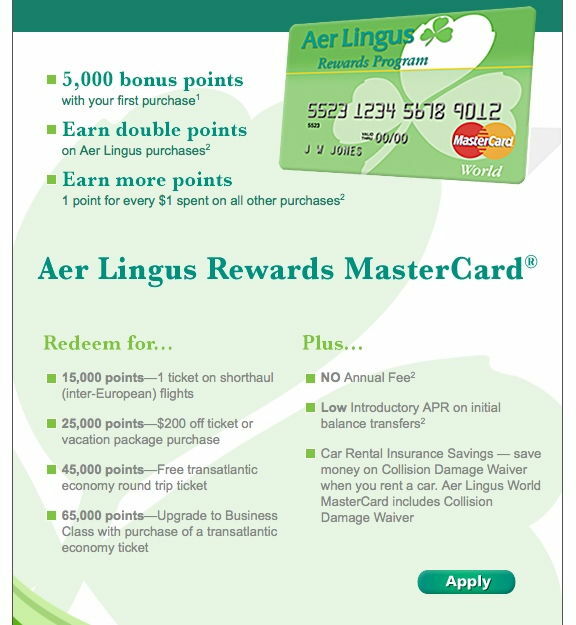 Hence if you want to earn Aer Lingus miles, this is the only card to get. But with no annual fee and the ability to earn doubles, this would be a no-brainer. Aer Lingus Application Form - This is how the Aer Lingus Application Page looks like. Just click apply at the bottom and fill in your information.